Ellie did her GCSEs at Longbenton, and stayed on for A-levels in Maths, Business, IT and Psychology. At the time she didn’t have strong ideas about where she was headed, and for the most part pursued the subjects she’d done best in. She chose IT because it’s a broad skill, and she thought it’d be useful to have. After Longbenton she moved to Newcastle College for a Level 3 Vocational qualification in Business, but after a year she heard about the apprenticeship programme offered by Accenture. You never really think there are good apprenticeships out there, but we’re college-funded, university degree funded, we still get paid at the same time. It’s a really good company to work for. At Accenture, she’s working on a project for HMRC. Her team gets a design sent to them, then they code a system which generates tax codes and national insurance systems. As an apprentice, she draws on support from her manager and her manager in turn, but also on a ‘buddy’ — a more experienced programmer who can help out as problems crop up day-to-day. It’s clearly a supportive environment. It’s the problem solving which makes me enjoy working with the taxes. 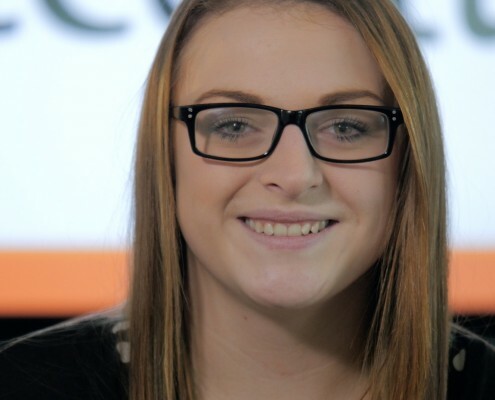 After her apprenticeship, Ellie wants to stay with Accenture, progressing within the company. She’s particularly interested in their work with the UK healthcare sector.